Abby Gondek is a social studies and special education teacher at the High School for Youth and Community Development in New York’s Flatbush section of Brooklyn. She expects to complete a master’s degree in special education at Long Island University in the summer of 2013. Kevin Skobac is engaged to Angela Im, whom he met after graduating from college. Former Brandeis basketball captain Gregory Kristof is managing director of Hoop Mountain, which operates basketball camps and year-round programs from New England to California. Among the Hoop Mountain offerings is the All-Academic Camp, an annual showcase held at Brandeis that brings together elite institutions with athletes who meet their academic standards. Alyson Decker, an associate at Blecher & Collins, had an article published in the June 16 edition of the Los Angeles Daily Journal. The article, “Is the State Litigation Privilege No More?” examines the Noerr-Pennington Doctrine’s impact on the California litigation privilege in federal court. Alyson’s practice includes complex business and commercial litigation, antitrust and class actions. Lauren Kanter married Aaron Applebaum on March 27 in Warrington, Pa. She is a resident in emergency medicine at the University of Pennsylvania and he is a bankruptcy lawyer. Catherine Albert and Katherine Lewis were bridesmaids. Sheila Kaufman signed the ketubah and Miriam Hurwitz read one of the seven blessings. Other Brandeis alumni celebrating were Robin Zebrowitz Harpak, Marc and Susan Abrams Kolpon, and Maya Goldin-Perschbacher. Adam Herman entered the Ph.D. program in higher education administration at Indiana University (IU) in Bloomington. He serves as a doctoral project associate at the National Survey of Student Engagement, which is housed at IU’s Center for Postsecondary Research. Sarah Graham married Brent Jones on March 20 in Fredericksburg, Texas. They met at a summer camp when they were 16. Samantha Joseph, Judy Nelson and Tobey Ward served as bridesmaids. Devorah Klein Lev-Tov and Maya Sigel also attended. Sarah is pursuing a master’s degree in science education at the University of Texas at Austin. Brent is a freelance web designer. The couple live on 10 acres that they are developing into a sustainable farm. Jayne Wise married Jenna Bussman on June 26 at the Barn at Gibbet Hill in Groton, Mass. The couple will use the surname Bussman-Wise. Jayne is the manager for marketing and digital programs for the New York Rangers professional hockey team. Jenna received an M.B.A. in May from New York University and is an associate in the training program at Deutsche Bank in New York. Hillel Skolnik is the new rabbi at the Southwest Orlando Jewish Congregation in Florida. A recent graduate of the Jewish Theological Seminary of America (JTSA) in New York, he served as rabbinic intern and Hebrew school principal at the Shelter Rock Jewish Center in Roslyn, N.Y., during the last year. His wife, Rabbi Sharon Barr Skolnik, is also a graduate of JTSA. Travis Seifman is studying for a master’s degree in art history at the University of Hawaii. He spent the summer working as an intern on a book digitization project at the Freer Gallery of Art at the Smithsonian Institution. He will be presenting his research at several conferences and symposiums this school year. Kelly (Baker) Cousineau and David Cousineau had a baby girl, Madeleine Marie, on June 20 in Washington, D.C. Kelly reports that mom, dad and baby are all doing well. Alex Thompson is chief operating officer of Prestige Beverage Group, a wine and spirits distributor that serves Maryland, Delaware and the District of Columbia. Michelle Shain and Adam Shain, M.S.’04, had a daughter, Elizabeth Ann, on March 19. Amy Non graduated from the University of Florida with a Ph.D. in molecular anthropology in 2010 and is now a Robert Wood Johnson Health and Society Scholar at the Harvard School of Public Health. She married Jorge Roman on June 18 in San Juan, Puerto Rico. He is completing a Ph.D. in statistics at the University of Florida. 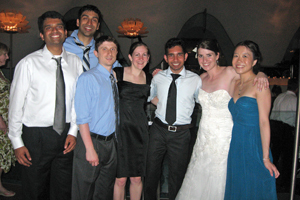 Many members of the Class of 2004 attended the wedding, including Santosh Ganesan, Sushrut Jangi, Matt Frischer, Sara Espowood, Hrishi Poola and Diana Kuan. Congratulations to Solsire Zevallos, who received a Ph.D. in neuroscience from the University of Pennsylvania in August. Shaw Lupton, M.A.’05, was promoted to senior real estate economist at PPR, where he advises institutional clients on their commercial real-estate investment strategies. He lives in Boston with his fiancée, Liz, and their cat, Pacha. Lynne Gauthier earned a Ph.D. in clinical psychology from the University of Alabama at Birmingham and has accepted an assistant professor position at Ohio State University, where she will continue working in stroke rehabilitation. Rachel Hartstein married Mitchell Ezra on July 10. Brandeis alumni in attendance included Eszter (Lengyel) Neuman, Anna Natsume, Anna Statnikova, Michelle Poliak-Tunis, Sarah Ferri and best man Ben Yudkoff. Following a honeymoon in Hawaii, the couple live in Piscataway, N.J. Eszter (Lengyel) Neuman married Ariel Neuman on Feb. 20 at the Sephardic Temple in Los Angeles. The groom’s brother, Rabbi Gil Neuman, officiated at the ceremony. Brandeis alumni in attendance included Michelle Poliak-Tunis, Anna Natsume, Anna Statnikova, Rachel (Hartstein) Ezra, Anne Austerlitz ’03 and Josh Zetlin ’03. Eszter and Ariel, both attorneys in Los Angeles, traveled to Vietnam for an adventure-filled honeymoon. Following an April 5, 2010, wedding in Negril, Jamaica, Eric Maklan and his wife, Stephanie, live in Boulder Creek, Calif., with their two cats, Juicebox and Fishstyx, and a new puppy, Pancetta. Eric is finishing a Ph.D. at the University of California, Santa Cruz. They will move to Boulder, Colo., early next year. He writes, “I will make a departure from academic science to pursue bodywork and structural integration at the Rolf Institute of Structural Integration.” Evan Graber and Jenny Blumberg will wed on Sept. 2, 2012, in Baltimore. Jenny is an OB/GYN resident at Stony Brook Medical Center on Long Island. Evan is a pediatric endocrine fellow at Mount Sinai Medical Center in New York. They met through Heather Ames. After five years in New York, Robin Tyrangiel, M.A.’05, moved to Beijing to study Mandarin. He and Aviva Zyskind ’09 chaired the first-ever Brandeis event in Hong Kong. Jocelyn Berger is pursuing a master’s degree in international affairs at the Fletcher School at Tufts University. She returned to Boston after nearly six years in San Francisco. 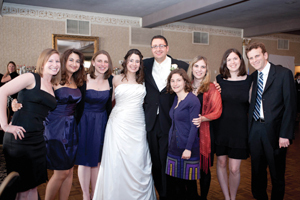 There was a distinctly Brandeis feel to the wedding of Lauren Kanter Applebaum ’04 and Aaron Applebaum, thanks in part to (left to right) Robin Zebrowitz Harpak ’04, Katherine Lewis ’04, Catherine Albert ’04, Lauren, Aaron, Miriam Hurwitz ’04, Sheila Kaufman ’04, Susan Abrams Kolpon ’04 and Marc Kolpon ’04. 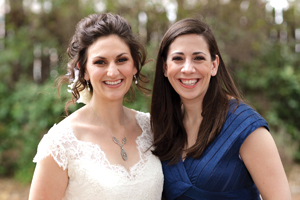 Samantha Joseph ’04 (right) served as bridesmaid at the wedding of Sarah Graham ’04, who married Brent Jones on March 20 in Fredericksburg, Texas. 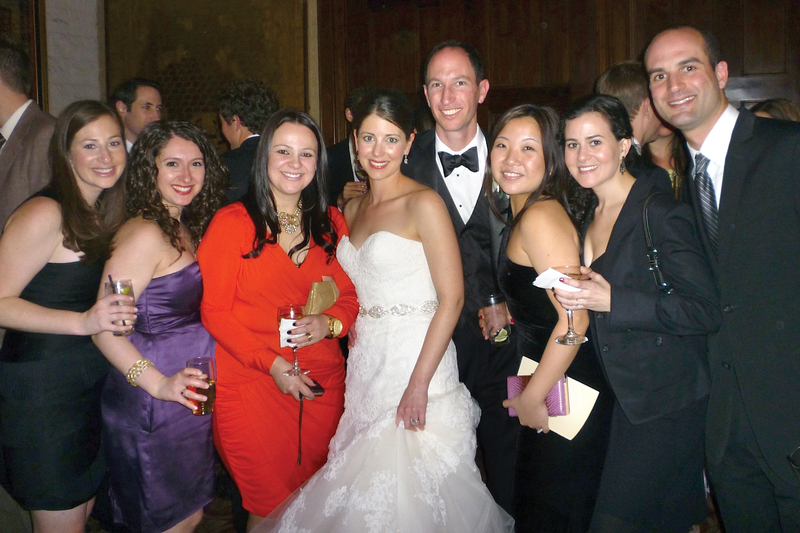 A number of Brandeis Alumni were on hand to see Eszter Lengyel ’04 marry Ariel Neuman. Shown are (left to right) Michelle Poliak-Tunis ’04, Anna Statnikova ’04, Anna Austerlitz ’03, Eszter, Ariel, Anna Natsume ’04, Rachel (Hartstein) Ezra ’04 and Josh Zetlin ’03. Several members of the Class of 2004 traveled to Puerto Rico to celebrate the marriage of Amy Non ’04 to Jorge Roman, among them (left to right) Santosh Ganesan ’04, Sushrut Jangi ’04, Matt Frischer ’04, Sara Espowood ’04, Hrishi Poola ’04, Amy and Diana Kuan ’04.